It is the Arabic word for Grandfather translated into English. Sittee or Sity (Sit'-ee) The Arabic word for Grandmother translated into English. Over time, some people have asked me why I choose Boxers over any other breed. Well. Every dog lover has a reason why they are attracted to certain dogs over others and it's largely just animal attraction. :0) Although, some others would say that a person is attracted to a certain type dog because they look and behave in similar ways. In my case, you don't know how true that is! HA! This is the cat who whacked him on his topknot and walked away in a humph. But I'll have to take you back to my childhood to tell you why I love Boxer Dogs! When I was a kid, my Sity and Jiddy were both very old. They had come to America from the Middle East in 1907 to escape persecution and to build a better life than they could in their old country. They could not speak English when they came, but quickly learned enough to get by. Jid worked as a construction worker building houses. Sity took care of the house and 6 children. She was one of the greatest cooks I've ever known and passed that talent and knowledge down to my Scottish Mother, who in turn, passed it to me. One of my fondest memories growing up was when we got to go to Sity and Jiddy's house. The food was always laid out in abundance and they had Duke. I don't know how old he was, but he was a gorgeous flashy fawn Boxer who loved and took care of his people. Jiddy would sit out on their big front porch in one of those old metal rocking sofas you used to see back in the 50's and 60's. Duke always laid at his feet while the old man slipped his shoes off and rubbed the dog's side, pushing the rocker at the same time. Sometimes, we'd pick up Sity and Jiddy and take them across town to our house. Duke didn't like that. He wasn't a trained dog. (He used to chase cars down the street trying to stop them). Our house had to be at least 6 miles away. Old Duke. He's just show up, looking for his pack. Busy traffic and all. I don't know how he did it. After a couple of times, we learned to put him in the car and take him with us, too! Because Jiddo was so old, he didn't realize that the traffic on the corner of his street had increased by 10 fold in the time he had lived there. But Duke did. Jiddo used to walk around the corner to the old TG&Y to buy wee toys for us kids, not realizing that the street had gone from a 2 lane to a 6 lane with traffic lights. Duke would walk (untrained, mind you) right by his side with no leash and in a perfect heel position. ---- Until they got to the corner. Then, very bravely and knowing that Jiddo would just step off the curb without knowledge of traffic, Duke would bolt out into traffic, running from one side of the street to the other. He would bark ferociously at on coming cars and make them stop. If anyone dared to move an inch, he'd be right there to say "Nope, Buddy. You will not make one move." Then he'd hit at the opposite traffic until all four corners were completely stopped. Running wildly at each corner until the old man got to the other side. Then, Duke would go to the other side himself, and wait patiently by the door until the old man came out; and the process would begin again. That dog loved that old man. He would risk his life for him and did it regularly. He also loved children. He played and played with us when we were together. We loved him. And when he was tired, he would just lay down where we were and let us all pile on top of him while he slept. He was truly one of the greatest dogs I've ever known. And when I got older and wanted to choose a dog that was right for me, I always remembered him. I did a lot of research into the breed and found that Boxers are ranked high on the list when it comes to being with kids and old people. (I've since heard of another Boxer who saved a wee baby from rolling off the sofa. It wasn't the dog's baby. It was a visitor to the house. The baby had never rolled over before, so was left on the sofa for a minute. The Boxer stood there, holding the baby up and keeping it from falling on the floor -- all the while making strange noises to be sure-- until the owner of said baby came back from the bathroom.) 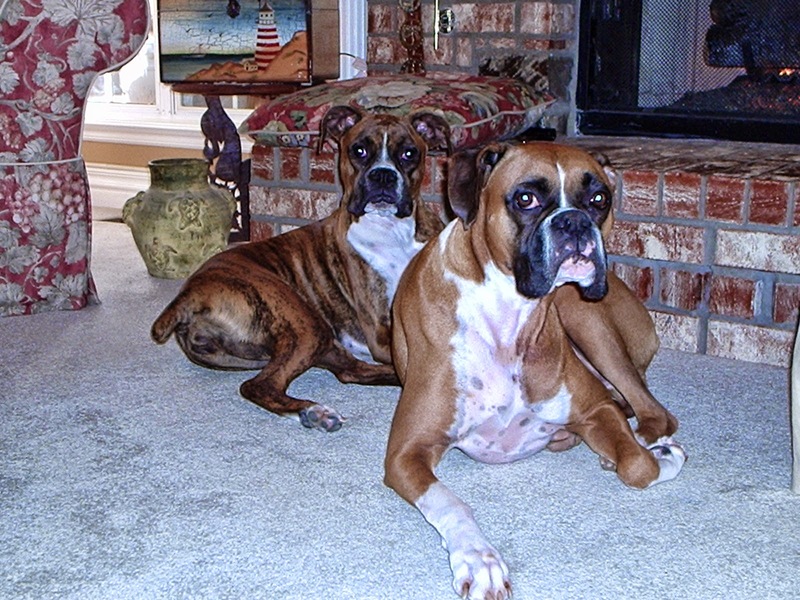 Of course, I've never encountered a Boxer (I've owned and loved 4) that was anything at all like Duke. He was special. But when we decided to take in our first Boxer, we named him for Duke. WishBone, Duke of the House of Hagg. And from his legacy, all other Boxer names are derived at the House of Hagg. The original Duke and the Duke of Hagg are still thought of fondly and missed greatly. Someday, I will live up to their Regal standards. Of course, I realize now, that having an untrained Boxer running up and down the street chasing cars is not a good thing. The neighbors didn't enjoy that aspect of Duke at all. My point in telling this story is not to say that anything your Boxer does is OK. I strongly believe in training both mind and body especially for this high energy breed. I am always amazed at how Duke ever found our house that first time, having never been there, but he did. He would not be deterred from being with my Grandfather. It was his job to take care of the old man and he would not relinquish that responsibility. I would bet that Duke would have been a very strong candidate for using the Bike Tow Leash. It would have run off some Toxic energy and he would have been much happier. Not to mention the neighborhood. Duke sounds like a grreat dog, and I'm glad he inspired your love of boxers!